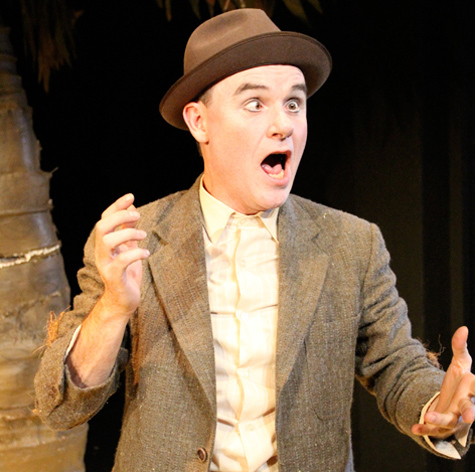 TAMARAMA ROCK SURFERS THEATRE COMPANY present FOOLS ISLAND by Darren Gilshenan & Chris Harris at the Bondi Pavilion Theatre, Bondi Beach. The principal creative force for FOOLS ISLAND, Darren Gilshenan: "So here is what I think …Theatre is its own delicious creature, full of symbol, metaphoric imagination and collaboration, it is bland when it is literal. It offers us a unique experience to explore an intimate relationship with a live audience. My aim was to challenge myself as a performer and utilise a wide skill set of performance qualities by creating a piece of theatre full of opposites; Physical performance and Shakespeare. Ridiculous comedy and dark tragedy. This is a festival show that aims to delight people visually, emotionally and aurally. It is about the extremes within us all...."
Since graduating from The National Institute of Dramatic Art (NIDA), way back in time, in 1988, Mr Gilshenan has built up a body of work that is impressive and diverse in all mediums. In the past two or three years, Mr Gilshenan has appeared regularly on Sydney stages and has made an indelible mark of regular excellence. His apprentice days are well over and what we have witnessed, of late, is the flowering of an artist with hard earned gifts and developed talent. An actor to appreciate. An artist of dedication and seriousness. The sheer joy of his work for the Bell Shakespeare culminated in him winning a Helpmann Award for Best Actor in 2004, for his performance in THE SERVANT OF TWO MASTERS. However, I watched his work as a member of the ensemble of Bell's RICHARD III, a few years ago and was impressed to believe in the quality of his work in that production. A dramatic actor of delicious judgement had arrived, and seemed to me, in my preference, to rival his comic exploits as Truffaldino in the Goldoni play. FOOLS ISLAND, a work written by Darren Gilshenan and Chris Harris embraces the two amazing skills that Mr Gilshenan has honed over his career: his physical penchant for comedy of the most dexterous kind and his embodied love of Shakespeare. The body and the voice. His twin loves has led him to a study of Shakespeare's clowns and his own contemporary scenario has incorporated them in the tradition of centuries, for Sydney audiences at the Bondi Pavilion. FOOLS ISLAND is set on a tiny island in the middle of a great ocean (Set and Costume Design, Jasmine Christie) on which there grows a single palm tree. Hurled to the beach from a mighty asteroid we find a flattened body that gradually gains a consciousness and investigates, like the evolutionary cartoons we may have watched as kids, the gradual growth of the organism crawling from the seas, to grow into, over time, a standing human, that acquires a voice, as it perceives and mimics similar creatures in the auditorium universe about him, and develops a language that has the beauty and pith of William Shakespeare. The surprise for the audience is that from this asteroid, not one, but, two figures have arrived: one called Gooden and one called Badden. These two opposites like Edgar and Edmund of Shakespeare's KING LEAR, find themselves rivals. The events of the scenario around a 'heroine' become crazily diabolical, full of much mirth and tinged with the sadness of contentious sibling spirits. The presence of two opposites allows Mr Gilshenan to explore, for our delectation, a range of physical comedy that is deliriously funny and underpinned with the beauty/wisdom of the texts of some of Shakespeare's Clowns (and otherwise). What Mr Gilshanan has is a comic sense that is expressed in a body and face of great flexibility. Recently, I watched Charlie Chaplin's great film MODERN TIMES and, the other night, in the theatre, recognised some of that inheritance in the work of Mr Gilshenan. Whether both of these gentlemen developed these gifts or whether they were born with them is a point to debate, but, certainly, I can remember, Mr Gilshenan, in 1986, give an hilarious performance of the whole of Anton Chekhov''s THE SEAGULL - all of the characters, in ten minutes! Maybe, he was born with this gift, for, he was very young then. While the scenario of Mr Gilshenan and Mr Harris is not yet wholly integrated, it serves as no distraction to the experience of this evening in the theatre. Jo Turner, the director; Max Cox, the lighting designer; and especially the live sound design and performance by Rose Turtle Ertler, accompanying the actions of Mr Gilshenan with sonic wit and skill, contribute flawlessly to the work. All deserve praise to them for this delight. The TAMARAMA ROCK SURFERS THEATRE COMPANY have expanded away from the Old Fitzroy in Darlinghurst in to the Bondi Pavilion Theatre, with, I hope, support from the Waverley Council (The Old Fitz is still in full occupation, as well). Could a city have two theatre destinations of more magisterial beauty then the Sydney Opera House and now the Bondi Pav? Nature everywhere. Beautiful nature. Standing on the board-walk of the Opera house is breathtaking at whatever time of day, and, similarly, standing on the balcony of the Bondi Pav, being seduced by the Bondi ocean breakers and the sea breeze and odour is as entrancing and beautiful. The young crowd of theatre goers mixed with the old guys and gals, and happily launched the season for 2011 at the Bondi Pavilion. FOOLS ISLAND is a show for adults and children. Mr Gilshanan is worth cherishing as a permanent memory of your theatre going. Take the family and welcome a new venture in an old venue and, I trust, develop a relationship with a new/old jewel in the Sydney theatre going experience.